New Delhi, Aug 17 (IANS) Vishal Bharadwaj's unusually titled and much-awaited dark thriller "Kaminey", starring Shahid Kapoor and Priyanka Chopra, is turning out to be a strong player at the box office. "'Kaminey' is the biggest opening for any Shahid, Priyanka and Vishal Bhardwaj film so far. We are completely delighted with the moviegoers reaction who have loved the film. The response has been fantastic," Girish Johar, AVP, UTV Motion Pictures, told IANS over phone from Mumbai. The movie which released Friday marks the acting debut of "Taare Zameen Par" writer Amole Gupte, who has impressed audiences in the film. The audience are lapping up the movie for a heady mix of Shahid's two avatars, edgy and power-packed music and fast-paced narrative. "'Kaminey' has received rave reviews and the movie has witnessed strong box office collections across locations. With the opening up of multiplexes in Mumbai today (Monday) we have seen the expected rush in advance bookings and expect the strong response to continue throughout the week and the coming weekend," said Tushar Dhingra, COO BIG Cinemas. Though the movie did not release in Mumbai Friday thanks to the swine flu scare in Maharashtra, it hasn't affected the collection of the film, said Amit Awasthi, manager, programming and operations of Spice Cinemas, Noida. "'Kaminey' has done very good business. We have collected a gross of around Rs.2.5 million over the initial weekend. The reaction has been mind-blowing as the holiday period proved to be a boon," said Awasthi. "However, it was only 75 percent of the audiences who liked the film despite good reports and the rest didn't quite appreciate it," he added. Nevertheless, "Kaminey", which released with 1,200 prints worldwide, is scoring well over multi-starrer "Life Partner", which released on the same day. "We are running 26 shows for 'Kaminey' in a day while six shows are kept for 'Life Partner' which has not been liked at all. The comedy is not that good. We collected only Rs.400,000 over the weekend with the latter movie," said Awasthi. A source from PVR cinemas said: "'Kaminey' has done exceptionally well and the reaction has been fantastic. We are hoping the movie will stretch at least for the next two weeks. However, 'Life Partner' has done only average business." The movie has now opened in Mumbai theatres. Mumbai, Aug 14 (IANS) Shahid Kapoor says it's a "challenge" to work with Vishal Bharadwaj but at the same time he admits that the director brings out the best in an actor. "Vishal is a very dangerous director. Working with him is no less than undertaking dangerous tasks because he brings you out of your comfort zone and asks you to perform stuff that has never been done by an actor in his life or career," Shahid said. The two teamed up for the just released dark thriller "Kaminey". Shahid plays a double role in the film. The film also stars Priyanka Chopra. "It's a challenge for an actor to work with him but at the same time it's very fruitful too... he brings out a new talent in you every time he takes a shot. He is multi-talented and very supportive and I'm very thankful to him," he said. In "Kaminey", Shahid Kapoor has dared to pick a subject which would have looked impossible to execute when read on paper. With his outstanding performance in the film, Shahid joins the list of top actors like Shah Rukh Khan, Aamir Khan and Hrithik Roshan. And yes, Shahid and Priyanka have a crackling on-screen chemsitry. After "Kaminey", audiences would be expecting a lot from him each time. Director Vishal Bharadwaj has redefined filmmaking with "Kaminey". While making the film there was absolutely no reference point for Bharadwaj at least in Bollywood cinema. He picked from from Guy Ritchie and Quentin Tarantino brands of cinema and adapted it perfectly to a Bollywood milieu. Bharadwaj takes his audience into a world that has perhaps never been explored before on Indian screen. He keeps introducing characters for the first 30 minutes while making sure that the twin brothers (Shahid) aren't brought together in a single frame till way past the interval. He also confuses his audience on purpose in at least a couple of sequences and tests their intelligence. There's the scene where two groups of three characters each are shown interacting amongst themselves and eventually it turns out that all of them were in the same room. Or the entire hotel sequence where a drug deal goes kaput. And then, of course, the eventiual coming together of all the 10 odd characters who are connected to one another. 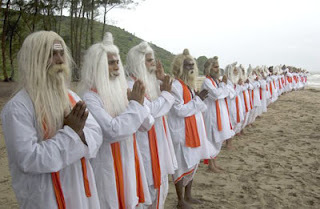 Set in Mumbai, the film is mostly shot on real locations. The director's insistence on canning shots outdoors pays off as the backdrop becomes difficult to disentangle from the elements of this thriller. So what one gets to see is a day in the life of two brothers who are on the run for different reasons. Guddu (Shahid) has seen a sudden marriage with Sweety, played by Priyanka Chopra who is excellent in her relatively short but meaningful and important role. He is now being followed by Sweety's brother (Amol Gupte). Charlie (Shahid) has got hold of drugs worth Rs.10 crore and is now all set to sell them off to fulfil his long cherished dreams. And in between, there are cops, gangsters, international drug mafia, narcotics department, a 'Jai Maharashtra' slogan-raising brother, an over-'coked' friend and his two mad Bengali brothers -- all of whom make sure that "Kaminey" turns out to be one joyride that keeps the excitement on till the credits start rolling. The film starts off decently though one has to concentrate hard to get the point of the narrative. All of that starts making sense after 30 odd minutes, but you still feel that there could have been a little more meat to the proceedings. However, the post interval portions make 'Kaminey' simply irresistible. Layer after layer unfolds, dark as well as humane side of people are put on display and finally comes an explosive climax that pretty much justifies the route that Bharadwaj takes in "Kaminey". "Kaminey" is one of the few must watch films of 2009. From narrative to execution -- Bharadwaj shows that he knows the art of creating a new world of cinema and lays out a road ahead for many aspiring filmmakers. 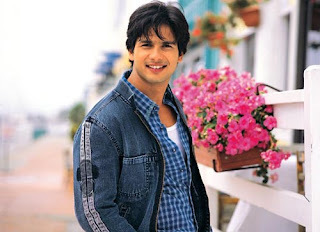 Shahid Kapoor (शाहिद कपूर; born on February 25, 1981 in Mumbai, India) is a Bollywood actor, trained dancer, and model. Starting off his career by working in music videos and advertisements, Kapoor made his Bollywood debut as a background dancer in Subhash Ghai's Taal (1999). Four years later, he made his debut as a lead in Ishq Vishk (2003) and won a Filmfare Best Male Debut Award for his performance. Following through with acclaimed performances in films like Fida (2004) and Shikhar (2005), he had his first commercial success with Sooraj R. Barjatya's Vivah (2006), his biggest commercial success so far, and followed it up with Jab We Met (2007). Before starting off his career as an actor, Kapoor worked in several music videos and ads, including the Pepsi commercial with Shahrukh Khan, Kajol and Rani Mukerji post Kuch Kuch Hota Hai (1998). 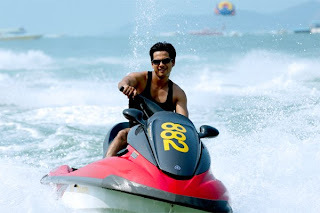 While doing so, he decided to join the Shiamak Davar Institute for the Performing Arts (SDIPA), where he was later seen in Subhash Ghai's film Taal (1999) as a background dancer in the song Kahin Aag Lage Lag Jawe along with actress Aishwarya Rai. In 2003, Kapoor played his first leading role as Rajiv Mathur, a carefree young man in Ken Ghosh's moderately successful love story Ishq Vishk. Appearing opposite Amrita Rao and Shenaz Treasurywala, the film was well received by audiences and Kapoor's performance earned him a Filmfare Best Male Debut Award. Film critic Taran Adarsh from indiaFM wrote, " Shahid Kapur is an actor to watch. He has all the qualities to hit the top slot. Not only is he good looking, but he is an amazing performer [sic], as well. Very original as a performer, the youngster has handled the dramatic and emotional moments with flourish. He is an exceptional dancer as well. All he needs to do is pick and choose his forthcoming assignments with care, so that the journey to the top slot is minus hiccups." The following year, Kapoor joined once again with director Ken Ghosh in the thriller Fida, where he co-starred alongside Kareena Kapoor and Fardeen Khan. The film failed to do well at the box office, yet Kapoor's performance was praised. The Tribune concluded, "...Shahid Kapoor shines in his role. He looks fresh. As an impulsive emotional and innocent guy, who is sucked into crime because of these very qualities, he manages to evoke your sympathies." He then appeared in the romantic comedy Dil Maange More opposite Soha Ali Khan, Tulip Joshi, and Ayesha Takia. 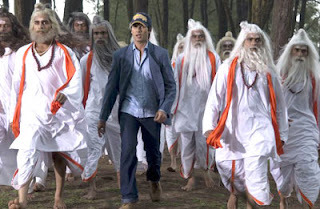 His performance opened to mixed reviews; Rediff.com wrote that "Shahid tends to imitate Shahrukh Khan a lot. He does it well in some scenes, overdoes it in others..."
Featuring in three more films in 2005, success continued to elude Kapoor. However, his performance as Jaidev Vardhan, a man who is sucked into the world of money and greed in John M. Matthan's drama Shikhar was critically acclaimed, earning Kapoor his first Star Screen Award for Best Actor nomination. According to indiaFM, "Shahid Kapoor is only improving with every film. He matches up to Ajay in almost all sequences." 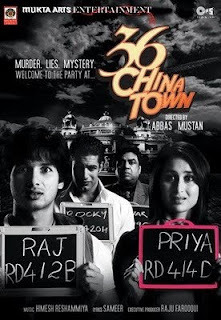 In 2006, Kapoor starred in 36 China Town. Revolving around the story of seven individuals and a murder, the film became a moderate success despite receiving mixed reviews from critics. Shortly after the release of the film, Kapoor's second release of the following year, Priyadarshan's comedy Chup Chup Ke. The film became a moderate success at the box office. Kapoor's last release of 2006 was Sooraj R. Barjatya's romantic drama Vivah, a film depicting the journey of two individuals from engagement to marriage. Co-starring alongside Amrita Rao, the film was received favourably by most critics and became one of the highest grossing films of the year as well as Kapoor's biggest commercial success to date. Kapoor's performance earned his second consecutive nomination for Best Actor at the Star Screen Awards. Taran Adarsh wrote, " Shahid Kapoor performs like never before. If he was super-cool in Ishq Vishk and showed flashes of brilliance in Fida, you've to watch him in Vivah to see his growth as a tremendous actor. He is exceptional in emotional sequences." During the summer of 2006, Kapoor embarked on his first world tour, the Rockstars Concert, along with Bollywood stars, Salman Khan, Kareena Kapoor, John Abraham, Esha Deol, Mallika Sherawat and Zayed Khan. In 2007, Kapoor appeared in two movies. His first release was Ahmed Khan's Fool and Final. The film received negative reviews and failed to do well at the box office; Kapoor's performance in the film did not receive postive reviews. His next release, Imtiaz Ali's comedy-romance Jab We Met, opposite Kareena Kapoor, became one of the biggest hits of the year. The film tells the story of two people with two very different personalities meeting each other on a train and how they fall in love eventually. Kapoor portrayed the character of Aditya Kashyap, a dejected young industrialist full of angst and despair. 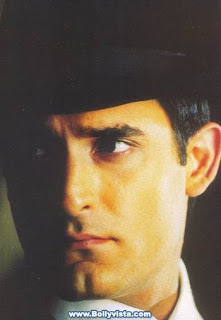 The film was well-received by critics and Kapoor's performance earned him several nominations for Best Actor at a number of award ceremonies, including Filmfare. Rajeev Masand from CNN-IBN noted, "Despite the risk of being overshadowed by Kareena, his co-star in the film, Shahid Kapur leaves an indelible impression with a performance that is understated and mature, and indeed the perfect foil to Kareena's boisterousness." Kapoor then appeared in the Aziz Mirza-directed film, Kismat Konnection (2008), opposite Vidya Balan. Upon release, the film under-performed at the box office. In 2009 Kapoor appeared in Vishal Bhardwaj's crime film Kaminey alongside Priyanka Chopra. In the film he played a dual role of twins Charlie and Guddu, each saddled with a speech impedimentand, receiving rave critic reviews for his perfomance in the film. 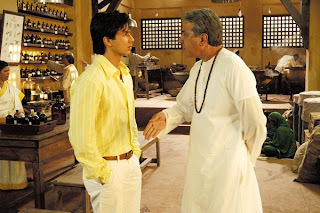 About his performance in the film Rajeev Masand from CNN-IBN said, "Shahid Kapur rises to the challenge of creating two entirely different characters out of Charlie and Guddu, and delivers a credible performance as each.Breaking out of his chocolate-boy image, he gives evidence of his potential when trusted with well-written roles. "Later this year Kapoor is going to appear in Anurag Singh's romantic comedy Dil Bole Hadippa! alongside Rani Mukherji and Ahmed Khan's upcoming film Paathshala.He is currently working on Ken Ghosh's untitled venture opposite Genelia D'Souza. Kapoor was born to actor Pankaj Kapoor and actor/classical dancer Neelima Azeem on February 25, 1981. Kapoor's parents divorced when he was three. After the divorce of his parents, he usually lived with his mother. He shared a good relationship with his father and stepmother Supriya Pathak. He studied in Rajhans Vidyalaya, Mumbai. Kapoor is also a vegetarian. He also has a sister named Sana and a half-brother named Ishaan Kapoor; his brother acted with him in the movie Vaah! Life Ho To Aisi (2005). His maternal grandfather was Anwar Azeem, a noted Marxist journalist and author from Bihar. 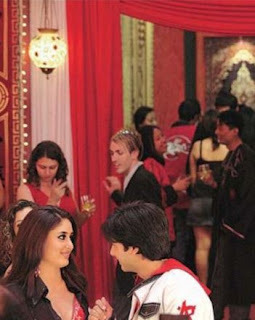 While filming Fida, Kapoor began dating Kareena Kapoor. They had dated for three years and then separated during the filming of Jab We Met.According to him, they remained on good terms, with him saying, "I wish her [Kareena] all the happiness in the world. I have great respect for her. She’s a wonderful girl." 36 China Town is a 2006 Bollywood film directed by Abbas-Mustan. 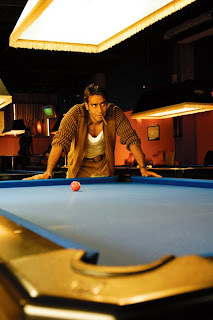 A Bollywood adaptation of Once Upon A Crime (1992), the film is a murder mystery that follows the investigation of a police officer trying to find the killer of a wealthy casino owner, Sonia Chang. The film stars Shahid Kapoor and Kareena Kapoor in their second film together along with actor, Upen Patel making his debut. Other cast members include Akshaye Khanna, Paresh Rawal, Johnny Lever, Payal Rohatgi and Tanaz Lal with a special appearance by Isha Koppikar and guest appearances by Priyanka Chopra and Tanushree Dutta. Released on May 30, 2006, the film was considered a failure by critics who criticised it for its weak storyline and lack of suspense. However it managed to do moderately well at the box office, becoming an above average hit/cult thriller. 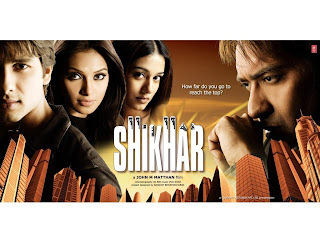 Shikhar (English: Zenith, syn: Top) (Devnagari: शिखर) is a Bollywood film, released on December 2005. It features Ajay Devgan, Shahid Kapoor, Bipasha Basu and Amrita Rao in the lead roles. This is the second movie directed by John Matthew Matthan, the man behind the 1999 hit Sarfarosh. The film marks the debut of Pakistani actor Javed Sheikh in Bollywood films.